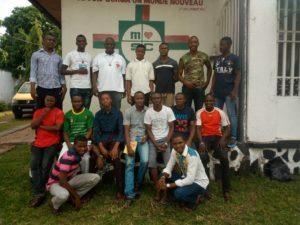 The MSC Pre-Novitiate Formation House in Righini, Congo, currently houses 15 MSC students and two formators. It is a place of reflection, of learning, and of prayer, as young men embark on the missionary journey. The residents of the formation house live primarily on a grant provided by the MSC French African Union – a grant which allows each person a sum equivalent to €11 per day. The formation house also owns an old minibus, and until recently, the students and their formators used this to attend the local university daily, as well as travelling for parish ministry. In April 2018, the minibus broke down and is now beyond repair. The pre-novitiates now travel on public transport every day, a situation which is unpredictable and time-consuming. The students are unable to travel together, and often cannot keep to their daily schedule. The MSC community in Righini are now raising funds to purchase a new minibus, which will allow the pre-novitiate students to travel safely and securely. This will also save a significant amount of money, as the minibus requires $30 worth of fuel per week, as opposed to the $10 per day spent on public transport. 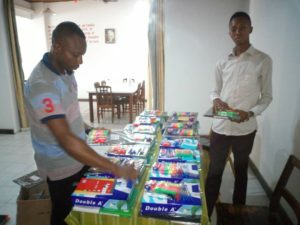 MSC pre-notivitiate students in the Congo are in great need of a new minibus to transport them safely and securely as they undertake their daily studies and go about their parish ministry. needed to pay for the minibus, and are now €15,000 away from the total cost. Can you help them to raise the funds they need to reach their goal?